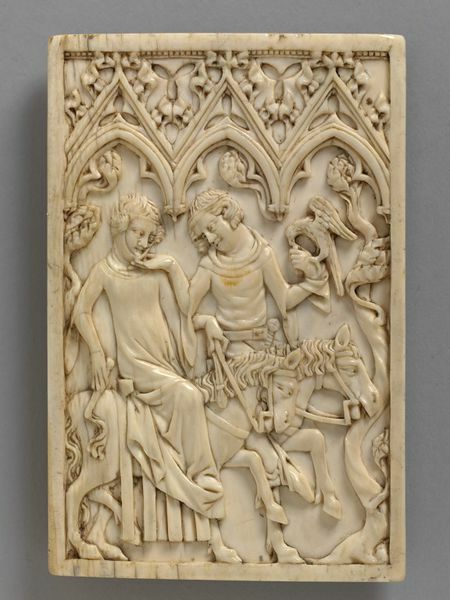 This is the cover of a set of writing tablets, depicting a hawking scene with a couple on horses. he facial types fo this high quality carving are closely comaprable to those on secular ivories produced in Paris just before the middle of the fourteenth century. 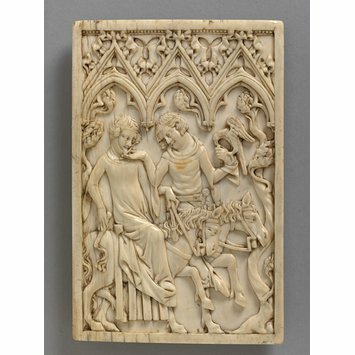 During the 14th century specialist ivory craftsmen carved both secular and religious objects in great numbers. Although Paris was the main centre of production, other workshops emerged in Italy and Germany. Some of the craftsmen may have been trained in Paris as their work often combines French and local styles. Writing tablets depicting secular subject matter are also common, and were produced from the second quarter of the fourteenth century onwards. The range of subjectrs depicted was similar to that found on mirror backs, combs and caskets, and often explored themes of courtship and love, as well as courtly games. Carved ivory writing tablet cover depicting a hawking party. Above are three trefoil arches supported on corbels. Above each arch is a gable, each with four large foliate crockets and a small finial; each gable is ornamented with a trefoil, and two further trefoils appear to either side of the central gable. At the top of the panel is a stepped, beaded moulding. Beneath the arcade, a couple are riding, the man is holding a hawk and has turned back in his saddle to caress the lady's face, chucking the woman’s chin with his right hand. His left hand is gloved, and supports a hawk, which he is feeding. The man wears a belt, to which is attached a sword, and the sleeves of his tunic hang in the extended fashion popular from about 1340. The lady wears a long, close-fitting robe, with a hood about the lower part of her face, and her hair dressed about her ears. She holds the reins of her horse in her left hand and a short whip in her right. In the possession of John Webb, London, by 1862 (London 1862, cat. no. 154); purchased from Webb in 1867, for £8.